I got a pair of 3x110mm frames a few weeks ago, and wasn’t expecting much… but in the end, I was seriously blown away! I’ve never liked skating 4x100mm frames around the city, 4x90mm had always been my maximum to enjoy skating outside circuits, and always thought the height was a big part of the problem, but I now realize it’s not the case. To test the frames, I took a pair of Rollerblade Twister Plus (with custom aluminum plates to stiffen the frame mount) and I replaced my faithful 271mm K2 Mod frames with the Powerslide “Pleasure Tool” 3x110mm frames (wow, who came up with that name!? ), mounted with Matter Juice F1 wheels. The mounting needs to be done a few millimeters further forward than typical 243mm frames. 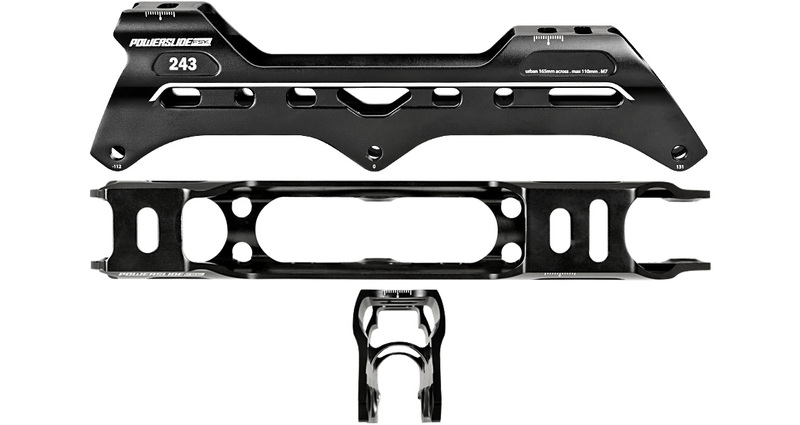 For anyone uncomfortable with such “rear instability”, the 3x125mm “Megacruiser” frames might be a better choice, given that their rear wheel is placed further back. The position was not an issue for me since I always mount my slalom frames forward on purpose, to ease heel wheelings. At first the height does seem like it’s going to be an issue, but it’s not, and in a matter of minutes, the combination of having both a short wheel base and large wheels becomes incredible. Thanks to my Twister’s stiff shells and spoilers, I was able to turn and slide as usual. And the 110mm wheels made it incredibely easy to maintain speed. 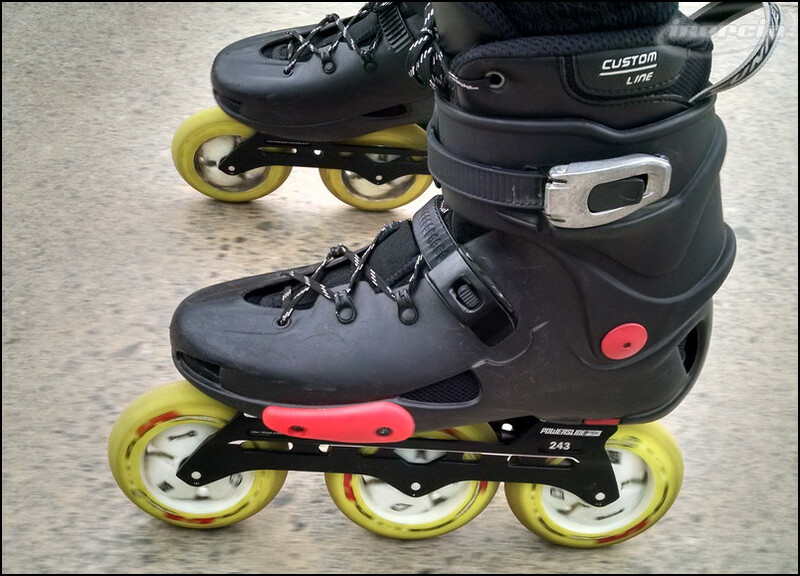 After a few days, I skated 32km in one evening, with a group where everyone else wore mostly Seba FR and Rollerblade Twister skates with 4x80mm. I felt like I was cheating! Seriously, the 3x110mm is just as easy to skate around, and gaining as well as maintaining speed is just so easy that it doesn’t feel fair! Those 3x110mm FSK frames are definitely keepers. I can now confirm that the whole “3 huge wheels” thing isn’t just marketing or hype, even though we’ll still need a few years to see if it’s here to stay. Given that the complete “Megacruiser Set” (frames + wheels + bearings + spacers) is priced around 130€, I really invite anyone curious and able to afford them to try them out! Good review, thanks, but what about rockering? Why is no one talking about that fact that three wheel frames rocker badly as the wheels wear down? My experience, skate-testing a 3×100 Doop Swift, was that after only a couple of hours of skating the front and rear wheels had worn enough that they had become considerably less stable in a way a four wheeler doesn’t. It’s an issue with three wheelers that needs to be considered if anyone’s thinking of investing. Pingback: Three wheeled skates – a wrap-up. | Że co, przepraszam?! I can not give an opinion about 3 x 110 but I can write about 3 x 125 bought yesterday. So… Powerslide Megacruiser Pro 125. First, Powerslide king of screw up a little of sizing chart. I have 260 mm foot so the good choice would be EU41, 265 mm, but i ended up with EU42 272 mm. This is not a bad issue, the liner is very consistent and maybe EU41 and heat moulding would be good for me, but didn’t want to take that chance, remembering my Seba FR1. On my Seba FR1 riding was a pain until bought an Balance liner, and the Seba liner went to a pair of Rollerbade TRS EU42 and fits perfect there. The Fatboy Myfit liner is good, i put the skates on and rode 38 km in the city with only moderate disconfort (upper part of the liner “tongue”). I felt the liner “breaking up” in the skates, taking the shape of my feet. The frame is well made, with torx screws. Good alignment, 260 mm. The skates are not heavy! The frame is not hard to handle. It is not like a slalom skate but very easy to get used to it. The bearings, Wicked ABEC9 are great, the 86A wheels have hood speed and grip. The 3 x 125 mm setup is awesome. Very good to maintain speed, a little hard to accelerate, and the small bumps and cracks on pavement only slows you down, not making the ride difficult. Much better than 4 x 80 mm for urban skating. The 3 x 125 mm setup is a great ideea for urban skating, a good and fun alternative of the bike and kick-scooter for city comutting. Skating is fun and pleasant and you don’t have to worry so much for the pavement. After one day and a first 38 km ride I’m happy with my choice.